I am a fiend for cutting recipes out of magazines and filing them in big Muji PP document files, which I then mark things like ‘Puddings’ or ‘Everyday’ or ‘Christmas’. People who come to visit look at my bookshelves and I know they think I’m bonkers. I AM bonkers. But, it does mean I have custom made books. And it was in such a book, called ‘Cakes’ that I found a recipe I’d cut out years ago. Most unassuming it was and by the lovely Nigel Slater. It involved pears. I’m usually a bit suspicious of people who say, when I ask them what sort of cake they’d like me to make them, “something with fruit in it”. I think a cake is a cake and if you want fruit, eat fruit. But there are exceptions, of course, and this is one of them. b) the cake calls for 165g of flour and I substituted half of that wholemeal, adding a quarter teaspoon of baking powder as the wholemeal flour I have is plain. c) I also used about 40g of wholemeal in the crumble topping. The cake didn’t suffer for it at all. By that I mean it didn’t become overwhelmingly worthy. But I do like to avoid 100% white flour cakes if possible. The thought of adding wholemeal flour may scare, but as long as you don’t overdo it and do it in appropriate cakes – i.e. NOT ones like Victoria sponge – then it just adds a lovely dimension to your baking and a good flavour. This is lovely warm, with cream. It reheats easily with a ten second blast per slice in the microwave. I don’t know why it’s so addictive exactly but it is. A superior cake. Eat it and cry gently. This entry was posted in Cakes, Picnics, Pudding, Teatime and tagged hazelnuts, Nigel Slater, pears, wholemeal flour on April 29, 2014 by Annalisa Barbieri. A few weeks ago, we were all up and needing to watch something suitable for all the family that wouldn’t be too scary or sexual or violent. We stumbled upon a food channel and there was a woman on there doing the top ten Italian favourites in this country. Or some such. Anyway. I’d never seen her before – she was called Michela Chiappa. And she was so sweet and happy and we all ended up completely entranced by the programme, and her. And later on, I made much of what was on her show, too. 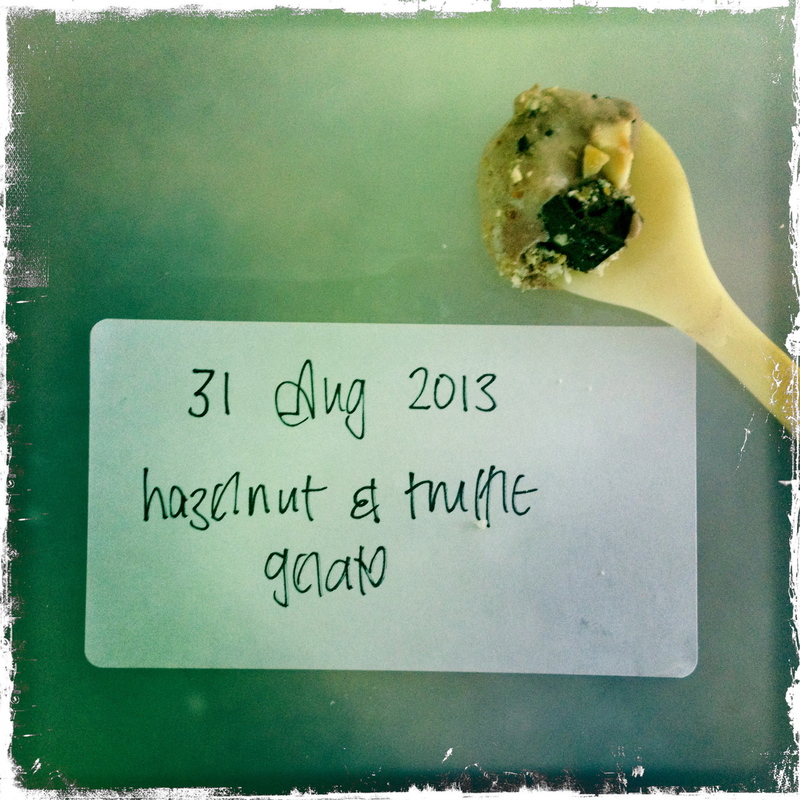 One of the things she made was this Baci and hazelnut gelato. Baci by Perugina are very famous Italian chocolates, not easy to find here. They are a hazelnut, a-top some praline and then coated in plain chocolate. I love them and whenever I go to Italy I buy some and bring them back. You can get them here (do a search) if you really want to use them, but they tend to be quite pricey when you do, so you can, as you’ll see in a minute, use alternatives. 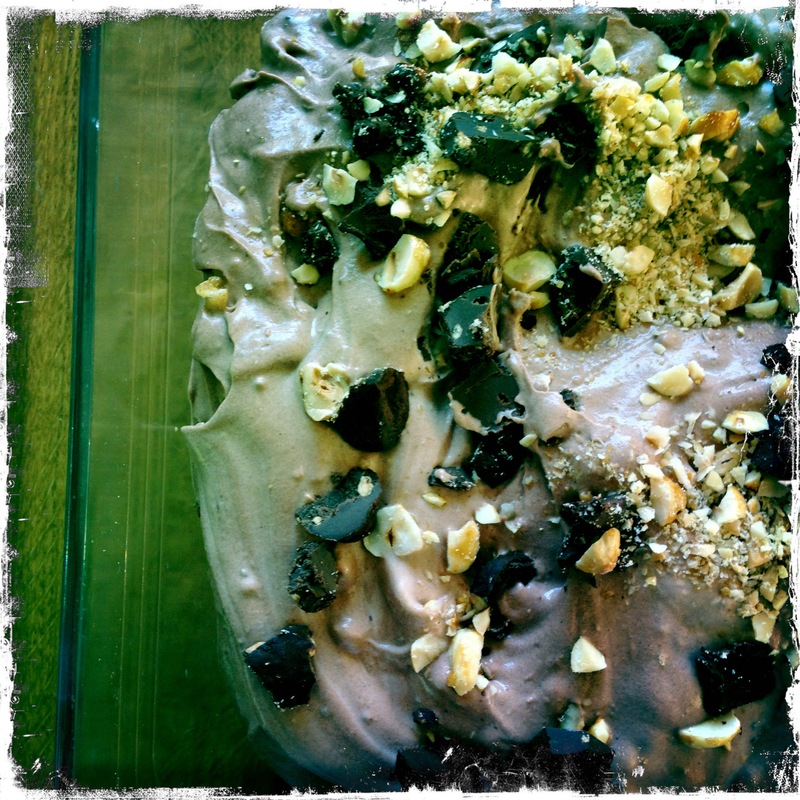 Anyway, Michela made this baci and hazelnut ice cream, the recipe for which is here. It’s egg free and you don’t need an ice cream maker. Double joy if you can’t eat the former and don’t have the latter. It isn’t how I usually make ice cream. As you can see if you go to the sub-groups over on the right and search for the Ice Cream section, almost all the ice cream I make has totally fresh ingredients in, like fresh eggs, cream, milk etc. This gelato of Michela’s uses condensed milk, which is a processed product. But you do need to make this ice cream at least once because it is amazing. Like frozen chocolate mousse. I didn’t use Baci I used Ferrero Rocher, which were lovely but messy to chop up and put in. You can see from the comments below the original recipe that lots of people have also had the idea of substituting Ferrero Rocher (and I thought I was being so clever). But I have also since made it (because, ahem, this has become a bit of a favourite ice cream in this house and one that everyone loves) with these Monty Bojangle Roasted Hazelnut Truffles. And the result was amazing and the chocolates are much easier to chop up than Ferreros. Whatever you do use, however, I would recommend it’s a soft chocolate, not anything hard which would affect the eating of this ice cream. Be warned. I never usually gorge myself on ice cream but it’s too easy to do with this. So here, slightly adapted, is the recipe. Put the 100g hazelnuts and the icing sugar in a frying pan and constantly stir on a medium to high heat until the hazelnuts are brown and the sugar caramelised. This takes me about five mins. Watch it so the hazelnuts don’t burn. Chop the hazelnuts so that you get a few chunks and a few fine bits. Put the condensed milk, double cream and vanilla extract into a bowl and whisk. As it’s about to form into soft peaks, add the cocoa powder. The thing you have to watch is that you don’t whip the life out of the cream before you’ve added the cocoa. Now all you do is add the caramelised hazelnuts and the chopped up chocolates, stirring through gently. I save some, as suggested in the original recipe, to sprinkle over the top of the ice cream before you put it in the freezer. That’s it. Put in in the freezer for as long as you can bear before having some. This entry was posted in Ice cream and tagged Baci, egg-free, Ferrero Rocher, gelato, hazelnuts, ice cream, Monty Bojangles on August 31, 2013 by Annalisa Barbieri. 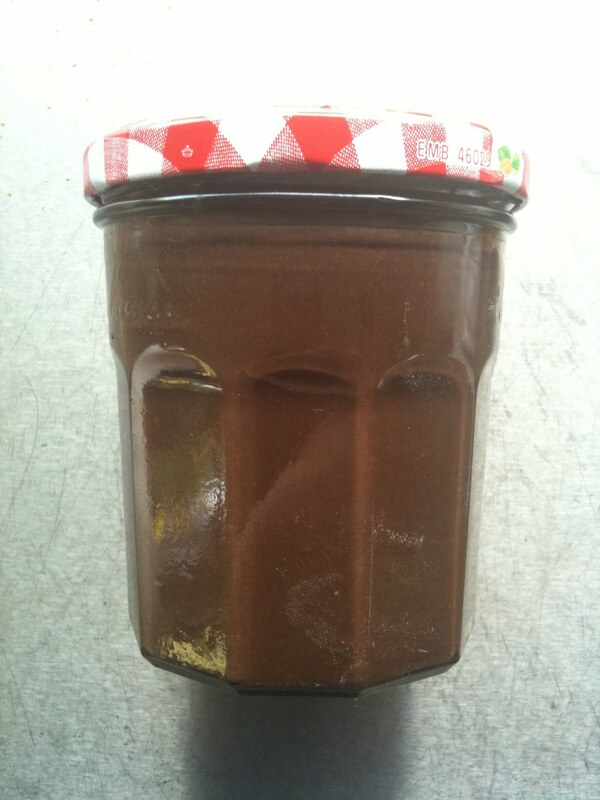 Not the most amazing pic but it’s real life home made Nutella-type spread in a jar, look! I know this doesn’t look good; two consecutive posts concerning chocolate. There is tons of other stuff I could be writing about, I’m just not very fired up about them though. And as this is a blog, and I’m not being paid, it has to be a bit enjoyable for me. In Italy Nutella comes in glass jars you can use, when you’ve scoffed the lot, as glasses to drink out of. They come in pretty patterns. I think you could get them here at one point too, but I don’t see them anymore. I used to eat Nutella out of the jar, on a spoon. I can’t believe this now as I find it quite disgustingly sweet. The ads sell it to you as having slow release energy thanks to the 1.5 hazelnut you get in every serving…we have Nutella in our house but I loathe it now. It’s laden with sugar. So when I saw Annie Rigg’s book about Edible Presents and saw there was a recipe for Chocolate and Hazelnut spread in it, I jumped. You probably can do this without a food processor, but I don’t. The recipe asks for you to use sterilised jars. I use them straight out of the dishwasher, if it’s good enough for Nigella, it’s good enough for me. 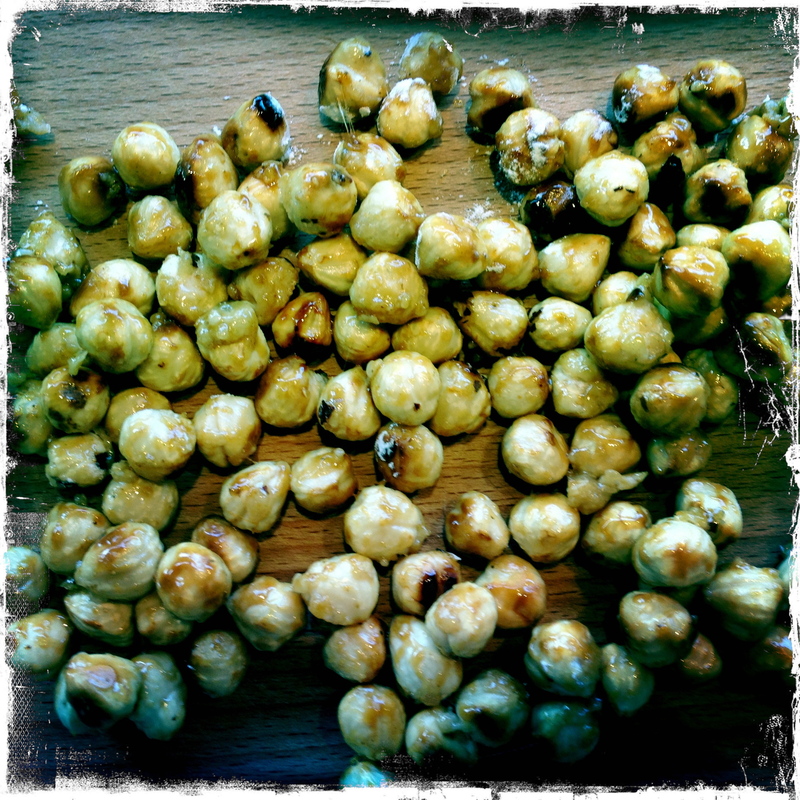 Toast the hazelnuts; you can do this in an oven or in a dry frying pan. Until they’re golden. Cool slightly and then grind to as smooth a paste as you can get in your food processor. Melt the chocolate, condensed milk and hazelnut oil, very gently, in a saucepan. When the chocolate has melted and it’s all mixed up nicely, pour this into the food processor, add the pinch of salt (I always use ground up rock salt in sweet things) and blend. Add as much hot water as you need to give it a thick, spreadable consistency. Don’t panic if, like me, you see it has gone really runny. It firms up in the fridge. That said, you shouldn’t overdo it, I’m just saying don’t go into a tizz if you have (you can always use it as super luxurious ice cream topping if it does go wrong). Spoon into a jar and keep in the fridge. Rigg says it keeps for up to two weeks. I doubt it will last that long. Now, I didn’t want to interrupt the recipe further up, with my tales of hazelnut essence, but I bought some from Bakery Bits. I was wary because, unlike the excellent other ‘essences’ I have from there (Aroma Panettone and Aroma Veneziana are exceptional) which have natural oils in them, the ingredients listed seemed decidedly un-natural. Stupidly I thought it was like extract of hazelnut or something (this is probably impossible to do). Anyway, the jury’s out on whether it’s nice or not but my verdict is: disappointing. Its aroma is rather synthetic and artificial. I liked it at first, but you need to go really easy on it as it can become very overpowering; and I’m not sure I’d use it again. My partner’s nose is far more sensitive and he found it overwhelming. This recipe doesn’t call for essence of any kind, but because I had it I added a few drops – about four. My seven year old loves this spread but says it’s too ‘hazelnutty’ which is probably accurate. I think this essence is good for when you really need to convey ‘this is made of hazelnuts’ without actually adding that many real nuts and that isn’t the case for this spread, or anything I’m likely to make. This spread is, anyway, delicious and whilst still not a health food, is a damn sight healthier than shop-bought. Mmmmm. Eat on toast, or on a croissant or straight out of the jar with your fingers. 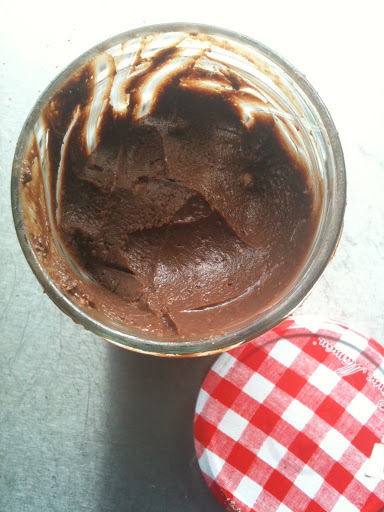 This entry was posted in Children, Chocolate, Confectionery, Presents and tagged chocolate spread, hazelnuts, home made nutella, nutella on May 23, 2011 by Annalisa Barbieri.